Flashback. 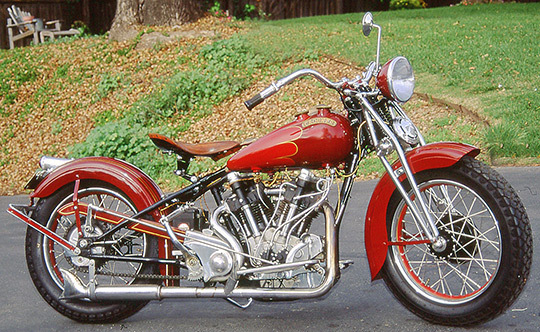 1940 Crocker Big Tank. Published by Cyril Huze July 13th, 2017	in Builders. What a beautiful bike. It just takes your breath away. Sump oiler, located at the bottom of the motor, like an early Indian. So whatever happened to the Canadian guy who was picking up where Crocker left off? Ain’t been nothing motorcycle wise before or since nearly as incredible – beauty , speed , engineering or quality wise as Crocker coming out of the US . There’s still a few out there unaccounted for. And even some of Paul Bigsby’s original patterns for them. When ever Crocker comes up I get to point out that as the evolution of Jud Carrikers shop (the Orange County, CA Crocker Distributor), we are in the position to honor Crocker’s original guarantee – “If you are ever beat in a straight up race with any other stock motorcycle we will buy back the bike at full, new retail price”. Pour une ancienne””elle est tres belle”surtout vu l’année! !